Shabbat-observant Jews who can’t tame their cellphone addictions on Friday nights and Saturdays could soon have another option besides either totally unplugging or texting the same way they do every other day of the week: the controversial Shabbos App, whose founders are set to raise funds on Kickstarter. In all but life-saving situations, use of electronics and even the ultimate dumbphone – the kind with an actual phone cord – is prohibited according to most mainstream Orthodox interpretations of religious law. But that hasn’t stopped some digital natives in the Orthodox world from refusing to give their thumbs a rest, even on the sacred day of rest. 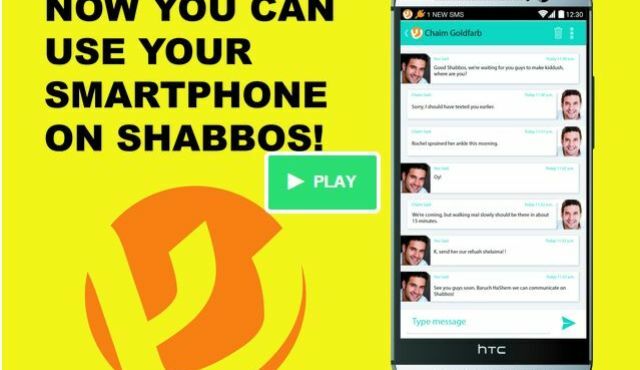 Shabbos App offers what its founders say is a way of circumventing the religious difficulties posed by Sabbath cellphone use in general and texting in particular, allowing inveterate texters to feed their habit without, say the app’s founders, violating Shabbat. “Our main goal is to let people who are already texting on Shabbos know that they can text on Shabbos and not completely fall off the derekh,” app developer Yossi Goldstein of Colorado told the U.S. website Vosizneias, whose target readership is Orthodox Jews. “Falling off the derekh,” or “path,” is a common way of referring to Jews who stop practicing Orthodox ritual. “Many people are already keeping a half-Shabbos because they find that they can’t get off their phones and they feel like once they are already breaking Shabbos they might as well give up on other mitzvos too,” said Goldstein, using the word for “commandments.” “Hopefully this will alleviate that.” Goldstein and the other developers identify as Orthodox Jews. But the app, which was designed by California resident Yitz Appel and has a draft Kickstarter page that has yet to go live, will hardly be facing universal acceptance among Orthodox rabbis. Even if the app resolves the religious problems relating to phone use on Saturday, texting on Shabbat “is very distasteful and not permissible on Shabbos,” Rabbi Moshe Elefant of the Orthodox Union told Vosizneias. The Shabbos App website says those kinds of objections should not be reason enough to resist the app, which it says will be available on the App Store and Google Play for $49.99, starting on February 15. It plans to seek $25,000 on Kickstarter. ‹ Tech at Summer Camp: Will the Policy Change?